YOUR MAMAS NOTES: Not only has iconic singer/songwriter/actor/director/producer Cher been trying to unload* her massive mansion in Malee-boo, CA for an ear piercing $45,000,000–now reduced to a still booty clenching $41,000,000–she's also recently put a never occupied Hawaiian hideaway up for auction with a pre-auction estimated selling price between eight and twelve million clams. 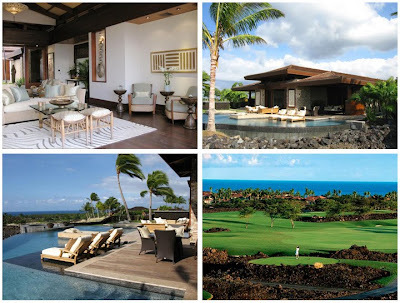 The recently completed residence sits on a .76-acre lot at the fancy Four Seasons Hualalai community on the Kona-Kohala Coast on the Big Island of Hawaii. Altogether, according to listing information, the compound covers 8,821 square feet of interior space with 6 bedrooms and 6 full and 2 half poopers. The main house is entered through a courtyard and covered porch where floor-to-ceiling mahogany doors slide open to reveal a seamless integration between the well-appointed–if too neutral for Your Mama's taste–interior spaces and outdoor spaces which all have dazzling views across the 4th fairway and to the glittering blue ocean. In the event of inclement weather or a rare chill on the air, sliding glass doors close off the main living space, which includes a vaulted ceiling inlaid with grass thatching, several seating areas, art niches, and mahogany detailing. The dining room, according to listing information, has sliding doors on all four sides that can either close or open the space to the living room, kitchen and outdoors. The adjacent kitchen features a large center island, high grade appliances including dual convection ovens, dual dishwashers, a built-in espresso maker, and a dual-climate wine refrigerator. The master suite, located within the main house, includes an expansive bedroom with walls of glass that slide open to a private lanai with views of the pool, golf course and ocean. The master bath has been fitted with double vanity with a wood counter top, a free-standing soaking tub and a walk-in shower as well as an outdoor shower. In addition to the main house, there are 5 free-standing bungalows–four with bedroom suites and a fifth designed as a media room and bar–that surround an Zen-like courtyard with streamlined landscaping, walking path and fountain. The infinity-edged swimming pool and spa has several lounging areas including a nearby lanai and a shallow shelf in the pool itself on which several chaise lounges eagerly beckon for Your Mama's big booty, Cher's surgically enhanced and unnaturally wrinkle-free face and a big ol' pitcher of gin & tonics. The backside of the swimming pool has a few palm trees for that island feel and a tumble of razor sharp volcanic rocks, which will cut a persons feet to bloody shreds if they make the damn fool effort to scramble across them bare footed. The property is scheduled to be auctioned on the 18th of January so any of you children who might have a 10 or so million to spare and would like to own a Hawaiian hideaway custom-designed by Cher herself have a few weeks to get your financial affairs in order. *The Malee-boo manse is not currently on the open market. If I'm gonna spent $10mm in Hawaii, it's going to be oceanfront...where I can walk out my house and onto the beach. Or a huge lot on the north shore of Kauai. Of course, considering the FS in Hawaii doesn't even HAVE a beach, it might be difficult there. Cher's Malee-boo manse still appears on the Hilton & Hyland listings. 45, 000 million?? wt? greedy much, how about donate to the fans who built the house for you. This blog is a hoot, and all my associates highly recommend it. That being said.That interior is a snooze fest.Agree, I hope she gives a lot of the sum to charity. Did I miss something? Where did Cher get that kind of cash? she got that cash from your pocket, thank you have a nice day!lol. these comments are a snooze fest. Purty but just not Cher-y enough for my tastes. Where in God's name is all that goth home decor stuff she was selling in the late eighties? It can't be in her garage in the 'Bu! I bet there's a warehouse in Commerce City full of Cher's wrought iron end tables, black silk drapes and candles made from her own lyposuctioned assfat. I want summa that because you know in 30 years that stuff is going to be worth what a Gio Ponti credenza goes for today! Gawd, I loves me some Cher!! Where did Cher get the cash? You been living under a rock for the last 40 or so years. Where in God's name is all that goth home decor stuff she was selling in the late eighties? I was thinking just that when I opened this post! What in the world happened to Sanctuary?!? Didn't the old girl earn enough moolah from that venture to keep her Hawaiian retreat? Or is she selling it to pay for Chaz's surgery? Is there a minimum or will it simply go to the highest bidder? Using an auction smells a bit desperate to me. Quite a few Hollywood types appear to need some cash, now. Does this mean that CHER plays GOLF? Well kids, the Sanctuary catalogues were a major dollars eater for the Dark Lady. The first imprint did well but cost Cher so much she tried to get some cash from the second. And though it was popular, it didn't provide the cash a night at the Mirage provided then. Let alone reimburse the $2 million she had reportedly invested in them. She tried to sell the moribund company but failed if I'm correct (too bad there were some really nice items I could buy today!). As for the "where did she get that money from"? Well kids, work, work and success: don't forget the 10 year-old Believe album was one of the best selling song eva (the album did very well) but Cher's cash mostly comes from touring. Two huge tours (Do You Believe 1999/2000 + The never ending Farewell Tour 2002/05) in the decade and her residency in Las Vegas since last year provided more than she'll ever need. And though Our Mama makes her best to keep us to date with Cher estates, some of Mrs Sarkisian LaPiere Bono Allman money was made through her estate investments and properties. Hard to believe but the Cher is more discreet than it seems. P.S. Cher doesn't play golf. Tiger tried to help but she's shy. And she doesn't even play tennis too. In late 2006, Cher auctioned off furniture (antique and otherwise), costumes and other memorabilia in a joint auction by Sotheby’s and Julien’s Auctions at the Beverly Hilton. Auction results can be reviewed at www.juliensauctions.com. Have fun! I think Cher is worth $600-700M and has one of the largest antique collections in the US. Cher is not worth that much. Rolling Stone once published quite huge numbers that were far from reality. The house sold for $8.72 million.